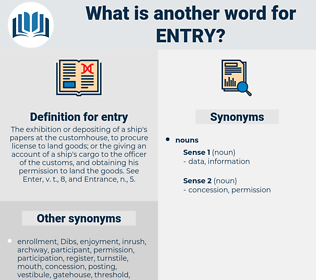 What is another word for entry? The exhibition or depositing of a ship's papers at the customhouse, to procure license to land goods; or the giving an account of a ship's cargo to the officer of the customs, and obtaining his permission to land the goods. See Enter, v. t., 8, and Entrance, n., 5. Carried, Brought, rolled, placed, thrown, laid, called. prerequisites, markings, admission, admissions, inputs, registration, registrations, penetration, entry-level. doorway, admission, driveway, foyer, departure, registration, penetration, annotation, appetizer, intrusion, outset, adhesion, door, hallway, advent, passage. egress, Blackballing, exit, fan, conclusion, spectator. refusal, dismissal, exclusion, expulsion, removal, ouster, withdrawal, ejection, departure, discharge, rejection. We come to you as messengers of the capital of the Tyrol, and are instructed to request you to tarry no longer, but make your triumphal entry into the city. That is the whole of the fourt entry, my lady. entire, emitter, entree, enhydra, Emmy Noether, entryway, enter, endear, endure. lexical entry, dictionary entry, notebook entry, Nolle Prosequi, nol pros.